Canning, who was suffering from terminal ovarian cancer, was seeking damages from the HSE, who withdrew her indemnity insurance to practice as a midwife. In 2015, her indemnity was restored by the HSE. It is understood she had not returned to work as a midwife since. In a recent Irish Examiner article, Canning had noted that she believed her only hope in fighting her cancer was access to the immunotherapy drug Pembro. She said she felt she had no choice but to get her case settled so she could access money for the drug. Canning passed away yesterday in the care of the staff at St Vincent’s Private Hospital in Dublin. Tributes have been paid to Canning across social media this morning. The Philomena Canning Campaign called her a “midwife, warrior, queen”. “We will hold you forever in our hearts and cherish the gifts you gave us,” it wrote on social media. Former client Ciara Considine told TheJournal.ie that Canning was a “great gift in my life and that of my family, as she was for so many of us”. She was a warrior who stood up for what was right at all costs and mothers along with activists for birth and reproductive rights country wide will be forever in her debt. Philomena at times reminded me of a great oak tree – tall and strong, flexible and endlessly able to renew after the storm had passed. There are many acorns in the ground where she had stood and the gifts she gave will flourish into the future. The Abortion Rights Campaign said it is “saddened to hear of the death of Philomena Canning”. “Philomena was a midwife, advocate, founding member of @Midwives4Choice and campaign for repeal. Rest in power,” it tweeted. She was the reason I started to campaign for repeal. Thoughts are with all those who loved her. We have lost a warrior. Philomena Canning, you made a difference. Philomena Canning’s requiem Mass will take place on Monday at 10am in St Mary’s church in Sandymount, Dublin. Following the mass, she will be returned to the family home in Glenvar, Co Donegal. Her funeral mass will take place on Tuesday at 11am in St Mary’s church in Glenvar, Co Donegal. 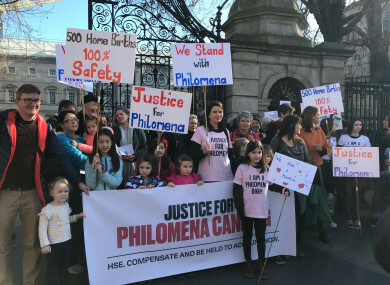 On 26 February, supports of Canning gathered at the Dáil to call upon Minister for Health Simon Harris to instruct the HSE to settle her case. Taoiseach Leo Varadkar was asked about the issue in the Dáil later that day. He said as far as he knows Canning had been offered a settlement. Email “'We've lost a warrior': Tributes paid after death of independent midwife Philomena Canning”. Feedback on “'We've lost a warrior': Tributes paid after death of independent midwife Philomena Canning”.